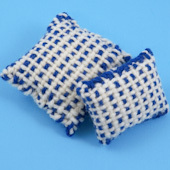 It's easy to make a pincushion in any color you like with a little yarn woven into fabric on a cardboard loom. 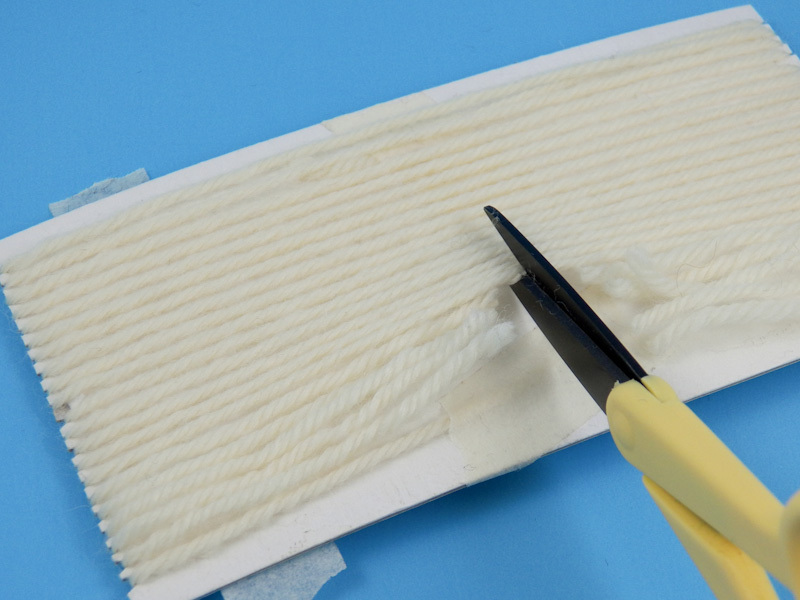 It's just a matter of forming a tube with the woven fabric, stuffing it, and sewing it close. You can weave a solid color pincushion with a single color of yarn used in both directions or a checked pincushion using two contrasting colors of yarn. 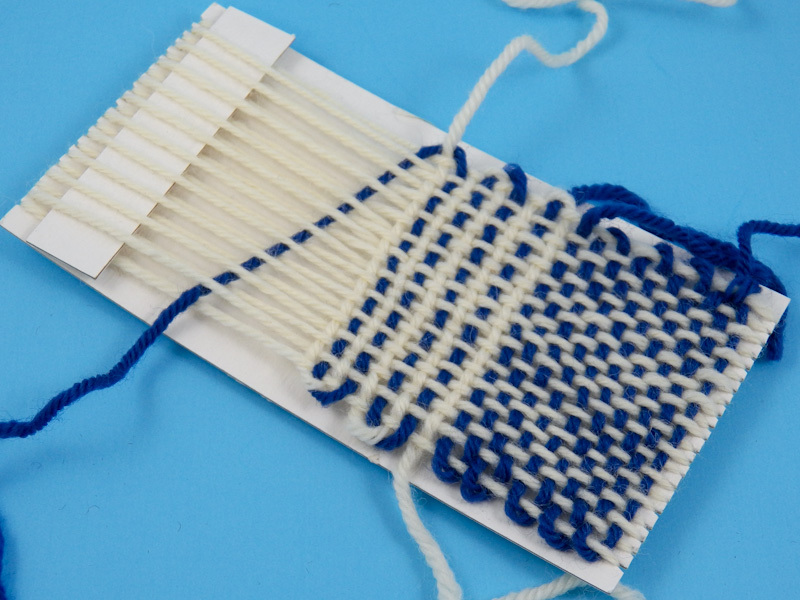 In this craft project, we will use a simple notched cardboard loom like the one featured in the Handwoven Bookmarks craft project. Review that project before starting on this one. Use the same cardboard loom created in the Handwoven Bookmarks craft project or, for a larger pincushion, cut a 3" by 6" (75 mm by 150 mm) rectangle from cardboard that is medium to heavy in weight—paper tablet backs work well. Mark and cut slots on each end of the cardboard. For the 3" by 6" cardboard, start about 1/4" (6mm) from the left edge and make 21 marks 1/8" (3mm) apart. Snip an 1/8" (3mm) deep 'V' at each mark on the cardboard. Project extra: Download Aunt Annie's printable pattern for pincushion looms to use as an aid in making a cardboard loom. Use the loom templates to cut the cardboard to size and as a guide for making the marks for the thread slits. 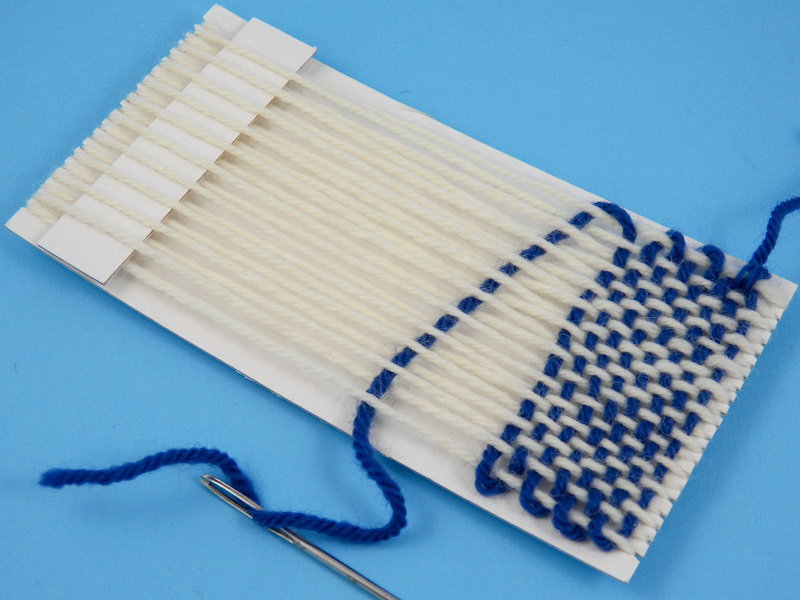 Follow Steps 2 and 3 in the Handwoven Bookmarks craft project to thread your cardboard loom and weave the pincushion fabric. For a solid color pincushion, use the same color of yarn for the warp and weft (vertical and horizontal threads). 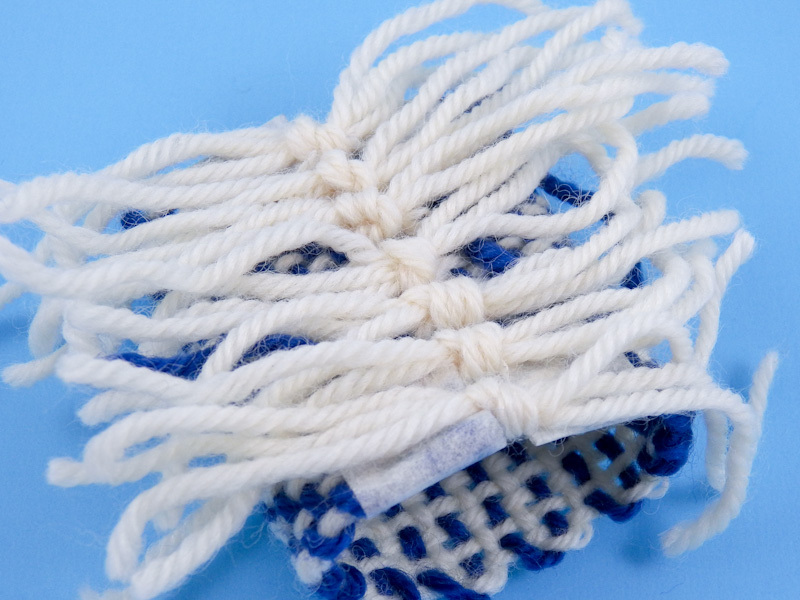 For a checked look, use two contrasting colors of yarn. 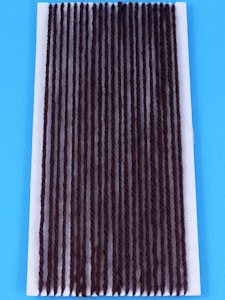 Warp the loom with one of the colors and alternate the two colors in the weft. 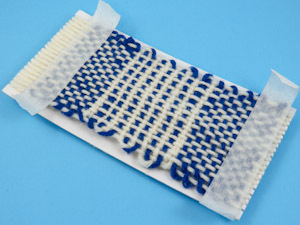 After the weaving is complete, hide the loose yarn ends by weaving them back into the fabric and through to the back. There is no need to snip the loose ends since they will be hidden inside the pincushion. 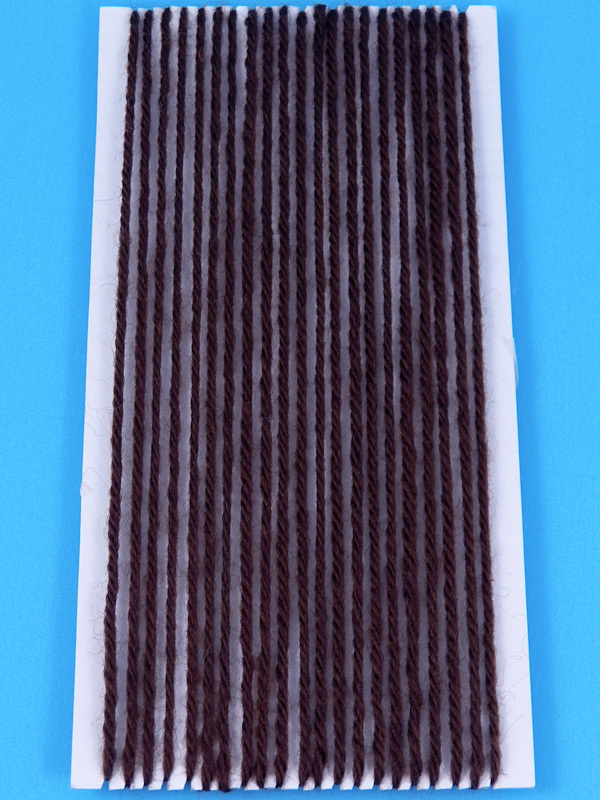 Stabilize the threads in the fabric before taking it off the cardboard loom. Apply a strip of low-tack masking tape over the threads at the top and the bottom. Tip: You can reduce the tack on regular masking tape by sticking it on clothing to pick up a bit of lint. Cut the warp threads on the back of the loom—in the middle. 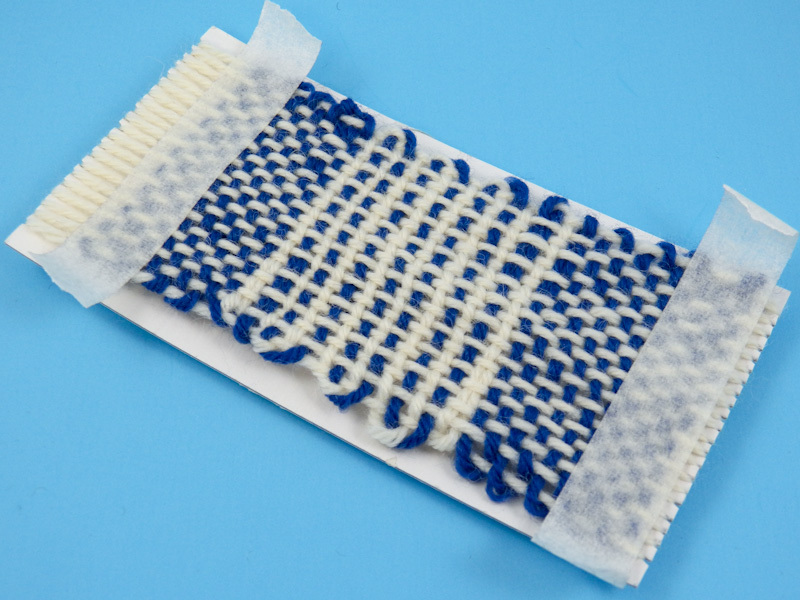 Take the pincushion fabric off the loom carefully by pulling the threads from the notches 2 or 3 at a time. Lay the fabric face side up and wrap the tape ends around to the back of the fabric. With the back of the pincushion fabric facing down, tie the loose threads at the top and bottom together to form a tube. Start with the middle threads and work out to each side, tying bundles of two or three threads together to close the tube. Turn the tube inside-out so that the back is on the inside. Carefully remove the masking tape. Stuff any loose yarn inside the tube. 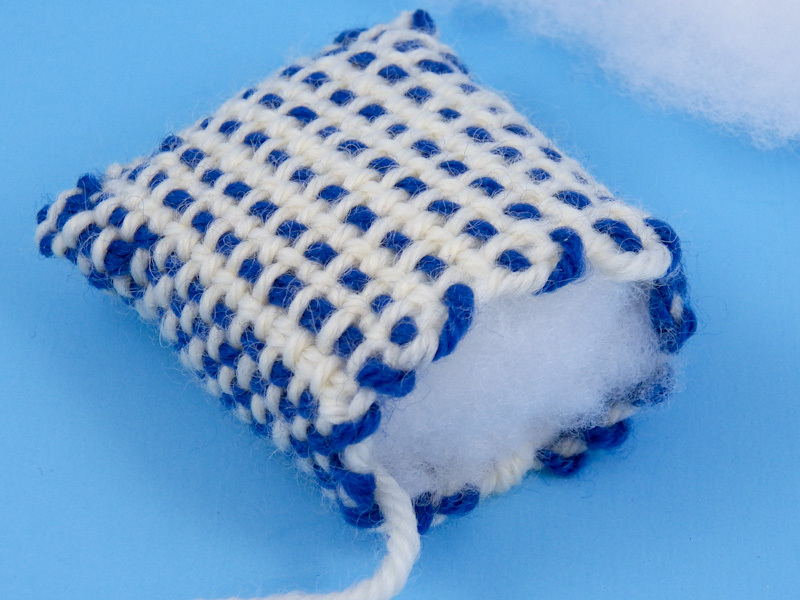 Flatten the tube on one side and stitch it together with an overcast stitch using the weft yarn. Stuff the pincushion, being careful not to overstuff it. 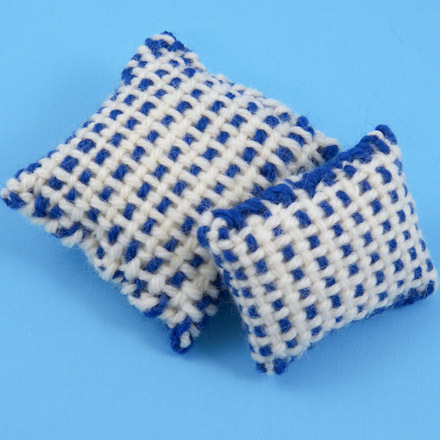 If you have some pillow or doll stuffing from the craft store, use that as stuffing. Otherwise, you can use cotton balls or torn-up quilt batting. Stitch the open side closed with the weft yarn. 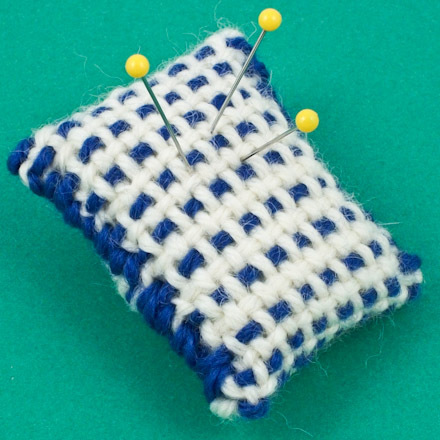 Tip: It's easy to make a larger pincushion by using a larger piece of cardboard for the loom. Just be sure to make an odd number of slots for the warp threads. That's it! Your pincushion is ready to use! 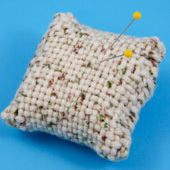 Tip: Make pincushions using a single color of yarn, like this one made with a tweed-look yarn. Tip: Use the cardboard loom created in the Handwoven Bookmarks craft project to make the smaller pincushion or the 3" by 6" loom to make the larger square pincushion.